This coffee was grown by UTZ certified farmers who implement better farming practices, with respect for people and planet. Edit Just seeing the "Not released yet" bit. heat great price has anyone tried them? 24% 1 star reviews on Amazon.com for Solimo capsules. Not risking damaging my machine even at this price. Looks as though they are rather weak, but it's all personal preference. And at 7p a pop it's the cheapest capsules you'll find. Plastic pods? Its a no from me, but hot for those less picky! 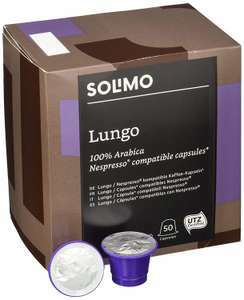 At last, a reasonably priced nespresso capsule. Certainly worth a try so I've ordered one. I just hope they are reasonable enough for a morning cup and they remain at this price. That'll keep me going for a while! Just spent an age going through the reviews. Now I'm not sure. 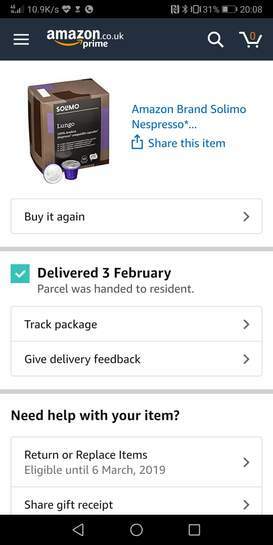 On balance they get a nod but maybe coffee is too important to me to put up with a product that seems prone to causing hassle. Gonna mull it over a nice cup of coffee. They are fine for me. No failed pods. Tastes fine. I have some, they are OK.
Not very strong, but no issues with them working, unlike other cheap pods. Bad capsules can jam in the machine which surely is not a good thing. I bought the last amazon lot listed here at £8.70 for 100. They're more than good enough, not premium but an excellent "crap I'm out of Taylor's/Starbucks/l'or pods" stand in. They can't. It's BS. Or idiots that can't fish a jammed pod out of a machine. They are available... They taste OK. I use two in a larger mug. I have tried many 3rd party pods and all the ones that have a foil at the bottom of the capsule are flawed - the foil doesn’t get fully punctured and this results in a weak watery coffee. I have tried many 3rd party pods and all the ones that have a foil at the …I have tried many 3rd party pods and all the ones that have a foil at the bottom of the capsule are flawed - the foil doesn’t get fully punctured and this results in a weak watery coffee. They dont jam and are a perfect fit. All capsules have the potential to jam if you dont site them properly before pulling the lever. Theses capsules arrived within days. They are fine. Not the best but at this price whose complaining. Certainly better than Taylors. Drinkable. I will have in cupboard as back up for when I run out. They can't. It's BS. Or idiots that can't fish a jammed pod out of a …They can't. It's BS. Or idiots that can't fish a jammed pod out of a machine.